My microwave oven shuts off or resets after about 2 or 3 seconds of cooking. The lights on the digital display panel ALL light up for about 10 seconds and then it resets and tells me to enter the time. After 3 seconds it resets and goes back to the enter time prompt. Have to re-enter time, am/pm and date. The clock needs to be reset every time. How do you fix this? Is something shorting out the power? Is it an electrical issue or possibly a bad control board or touch panel? It will depend on the brand of your microwave. 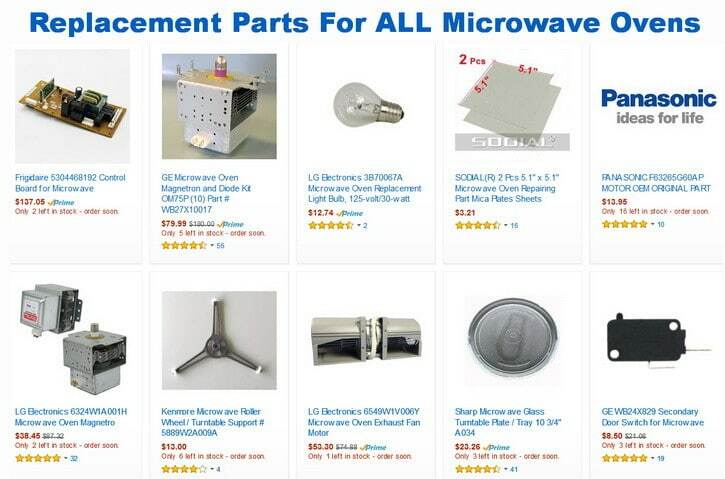 It may be a bad or failing part on your microwave. You could have a door switch that is bad, a main control board that is faulty, and a few other parts that can be causing your microwave to shut off. We will list ALL replacement parts below. You put a cup of water in your microwave, press ONE MINUTE, and the microwave runs for 2 or 3 seconds and shuts off or resets itself. Almost like when you first plug it in, all lights on the digital display come on and then it asks you to enter in the time. It is like the microwave is resetting itself each time. 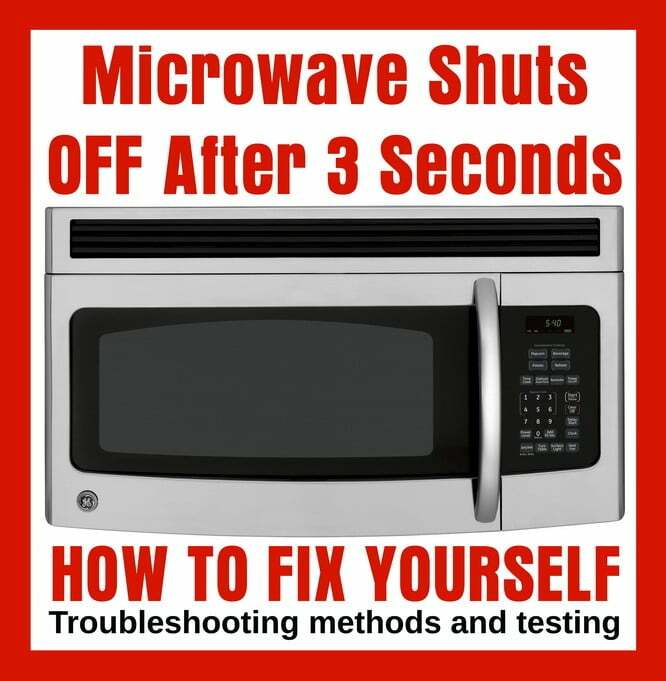 You will have to do some troubleshooting to find the exact part that is causing your microwave to keep shutting off. 1 – Microwave door switch = Check each door switch for arcing or burning. If there are no visible signs of damage then use a multimeter to test the switch for continuity. If there is no continuity or there is visible burn marks on the switch we recommend to replace the switch. 2 – Main Control Board = Check all other parts first. If the components are working as designed and you find nothing else bad then replace the main control board. 3 – Touchpad or Control Panel = Press each button on the control panel. If any buttons respond but some do not then replace the touchpad and control panel. 4 – Transformer = This component will produce a burning smell if it goes bad. DO NOT replace this yourself as it can hold large amounts of electricity even after being unplugged. If this part is bad, either throw your microwave away or hire an electrician to replace because of safety reasons. 5 – Thermoprotector = When the microwave runs for a few seconds and stops then the thermoprotector may be tripped. The thermoprotector is a safety device to make sure the microwave does not overheat. Use a multimeter and test for continuity to see if it needs to be replaced. 6 – Thermostat = Thermostat may be bad. Test it to be sure before replacing. We then thought that if the problem happens after 3 seconds, maybe it had something to do with when it started to actually microwave (cook). The first 2 or 3 seconds was just a short waiting period before the microwave would actually start to cook. The magnetron was possibly shorting the control board somehow? Once the magnetron was running, the microwave oven turned off. Instead of replacing parts one by one, we tried an experiment. We wanted to make a barrier between the magnetron and the main control board. We put a piece of aluminum foil in a computer style anti-static bag. We used 4 thick pieces of aluminum foil in each bag. We put one foil filled bag near the top of the back of the main control board, and one foil filled anti-static bag near the bottom of the control board. We made sure that no aluminum was touching any electrical components. We gently put the main control panel back in place and put the screw in to hold it in place. We plugged in the microwave and tested it. The problem was fixed. Somehow RF was leaking from the magnetron and sending a frequency to the control board strong enough to reset it. By adding a barrier to the back of the main control board, the issue was fixed and we did not have to replace a single part. We hooked up the turntable motor, put all the parts back on the microwave and everything worked perfectly. We DO NOT recommend you do this as it is just meant as a test. If you try this and it fixes your microwave from shutting off, you should replace the magnetron in your microwave or buy a new microwave. Have other reasons or parts that could be causing a microwave to stop working after a few seconds? Please leave a comment below. Our LG LCRT2010 turned off after a few seconds of heating. The problem turned out to be a bad connection at the over temperature thermostat mounted to the outside of the oven cavity. The thermostat disconnects power to the microwave if the oven gets too hot, so it carries the full current of the microwave, which can be large. When the Magnetron turns on, the large current flow through the bad connection causes the connector to heat up. The heat from the bad connection warms the thermostat, which then pulls the plug on power to the microwave. The behavior is the same as if the plug to the microwave had been pulled. The root cause is probably inadequate pressure of the faston connectors used to connect to the thermostat. I removed the connectors and soldered the wires to the thermostat to fix the unit. It’d probably be a good idea to replace the thermostat for less than $10, but I didn’t bother. The reason it shuts off after a few seconds is because who ever was pressing all the buttons put it in Demo mode -op-6. Hit the Clock and Settings button 6 times on your Kenmore and then hit start and it will work fine. Yeesch!! Regarding the barrier solution that blocks leaking RF, it would be very helpful to have included a few pics or diagrams. Yes it would have been helpful, however…. It is not an APPROVED repair or fix method for Microwave ovens. This is why we did not include any pics as it is more of a TRICK than a solution however it works for about 70% of microwaves with this issue. Simply search Google for HOW TO ADD A BARRIER BETWEEN CONTROL BOARD AND MAGNETRON IN A MICROWAVE OVEN and you will see pics. My Panasonic Microwave turns off after a few seconds and I have tested every part in the microwave and they all test good, what is my next step, how do I fix this problem? Microwave oven reset within a second after start. All parts are working good, other than the board. What is the problem and how to rectify it? 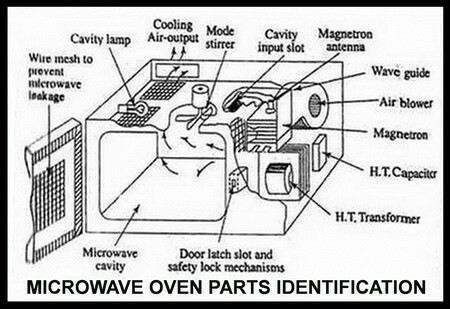 Have you used the info above to attempt to solve the problem with your Microwave? What is the make and model of your Microwave oven? My question is on a Quasar Panasonic high-end microwave convection unit from about 1992. It runs well… but the microwave function will quit after 1 to 5 minutes. I have wondered if it was moisture related but did not see the part in your video (if its there) relating to finding, identifying, testing or replacing a moisture sensor. But this may well not be the issue. Q: Where would you suggest I begin testing? In the past it had arcing on the upper door latch switch and I soldered that and fixed it. And the door ‘button’ external plastic part broke years ago and I now just push inwards with my finger has worked well for 10 years this way. The inside switch actuators are all solid and working well. It has had some logic board oddities in the past, like failing to keep the mag fan on when the unit is running… but this ‘cleared up’ on its own some years ago. And I have a manual fan switch to force the fan to stay on as needed. You may have an issue with the Magnetron putting out excess and actually making the board malfunction and therefore it shuts off after a few seconds. You can try the trick we have above by putting Aluminum foil in a thick bag and placing it in behind the board to disturb the interference. On our microwave, the RF signal was leaking therefore shorting the control board. Adding an aluminum barrier (in a plastic bag) helped stop the RF from interfering with the control board and fixed the issue.